Riding lessons are the best way to get started in horse riding and improve existing riding skills. Most riding lessons take place at Riding Schools or other equestrian centres (see our article on 'Riding Schools' for more advice on finding one that meets your individual needs). Most people opt for a Riding School. If this is your choice make sure that you pick a Riding School that has been approved by the British Horse Society (BHS) or the Association of British Riding Schools (ABRS), as these have met the high standards that are necessary for passing the yearly inspections. Riding lessons fall into two categories: private or group. Both of these have their pros and cons, but most riders will usually opt for private lessons if they had the chance. Group lessons involve a number of riding students (sometimes as many as ten, but often less than that) receiving a lesson from the same instructor at the same time. As the instructor has to split his or her attention between lots of students, they can't single any one person out for extra help, as there simply isn't enough time. If you feel that you're not progressing much after attending a few group lessons, it might be worth switching to private lessons. Private lessons involve much smaller groups of students than group lessons, which often gives your instructor more of a chance to interact with all of the students in the group. Because of this, riders taking private lessons often advance quicker than those taking the group lessons. The downside of this is the cost, and the extra help and support doesn't come particularly cheap. If you can spare the extra cash, most riders consider private lessons to be far more beneficial than group lessons. Riding establishments will set their own prices for riding lessons, but the average group lesson costs around £20 for a one-hour session (of which approximately forty-five minutes are spent taking part in actual riding). The average private lessons costs around £35 for a one-hour session (as with most group lessons, the whole hour won't be spent riding). You don't need specialist riding clothing for your riding lessons. Some riders like to wear jeans, but these aren't always comfortable and can be quite restrictive. Jodhpurs and tracksuit bottoms are better in this respect, as they give your legs more of a chance to move. On your top half, you can get away with a light t-shirt (worn underneath a body protector) in summer. In the colder months, you'll probably need a sweatshirt or fleece jacket to keep you warm! Riding boots are the best type of footwear, but anything with a slight heel will stop your foot from falling out of the stirrup while you're riding. You might also want to wear half chaps, but this isn't a requirement. A riding hat is absolutely essential for safety purposes, and it's important to get one that is a perfect fit so it doesn't move around too much. 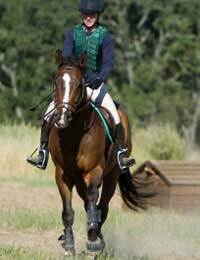 Riding gloves are an optional extra, but they will stop your hands from slipping on the reins. Riding lessons are a great way to perfect your riding skills, no matter how experienced you are. You don't need fancy riding clothes for most riding lessons, so you don't have to worry about that side of things. Riding lessons can be quite expensive, but most riders consider them to be a worthwhile investment.